Beck’s durable gear train maintains accurate, consistent positioning even under the demanding conditions of an active control loop. 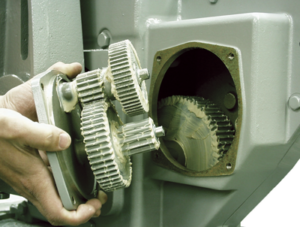 Gear trains employ a unique, all spur gear construction using only heat-treated alloy steels and ductile iron. Efficient, wide-faced spur gears ensure long life and eliminate wear-induced backlash and positioning inaccuracies common in worm gear and “Scotch-yoke” designs. Integral self-locking mechanism ensures that actuators hold a minimum of 200% of rated torque with the motor de-energized. Durable design provides up to 4 days of protection against intermittent or extended accidental stalls. Stall protection is provided by the DCM. If the motor tries to run in one direction for more than 300 seconds, the DCM-2 will shut off power to the motor and a status indication LED will activate indicating a stall. 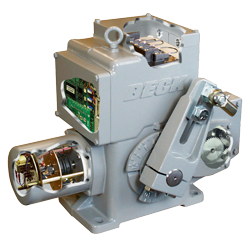 Beck actuators feature a cast aluminum body with individual compartments to protect components from moisture and dirt, and allow easy access for installation and calibration. Precision-machined aluminum alloy castings with corrosion-resistant polyurethane paint provide a rugged, dust-tight, weatherproof Type 4X enclosure. Individual compartments protect all major components: Motor, DCM-2, CPS, gear train and installation wiring terminal board. Gasketed covers provide extra protection for abusive indoor environments and harsh outdoor climates. Each compartment can be accessed without exposing other components to the environment. Output and Handwheel shafts are sealed with weatherproof, double-lip cartridge seals.